Read here about a How To to construct a tensegrity hammock stand. This stand has struts 123" long. Tendons are 7/64 amsteel, and they need to be that strong. The tensegrity distributes the forces acting on it throughout the structure, and those forces are considerable. When you tighten that last tendon to assemble it, you're tightening all of them. How tight you make it depends on how springy you want it to be. It works fine in a slightly loose (springy) mode for hanging a hammock, but you still need to pull pretty hard. I loop the final tendon three or four times through the carabiners at the pole ends to get some mechanical advantage. The tool of choice would be a 2-ton come-along. I used cast aluminum end caps for chain-link fence from Lowes. The stand has a small base with one corner staked, not visible. You wouldn't need to do that with this stand if there were three hammocks on it and everybody got into and out of the hammocks simultaneously. 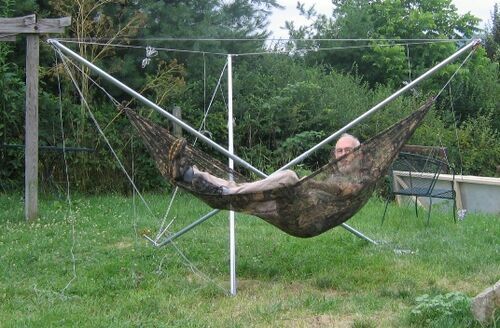 3 strut hammock stand by WV. Photo by WV. This page was last edited on 24 November 2018, at 16:32.